I've been a fan of Olfactive Studio since 2012, when the niche line was introduced in the United States; I've already reviewed Still Life, but I must admit that Lumière Blanche is my favorite. It was developed for Olfactive Studio by perfumer Sidonie Lancesseur and its composition includes notes of cardamom, star anise and cinnamon; iris, almond milk and cashmere wood; and cedarwood, sandalwood, tonka bean and white musk. 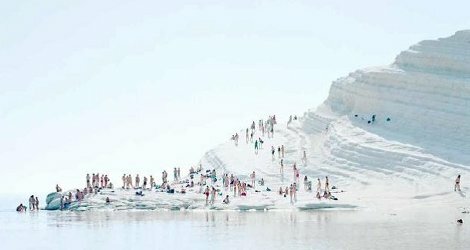 It was inspired by a photograph by Massimo Vitali (above), showing a sunlit beach with pure white sand; like all the fragrances in the Olfactive Studio collection, its name also refers to the techniques and effects of photography. I like Lumière Blanche so much that I almost don't want to talk about it, but Victoria has already written a lovely review on Bois de Jasmin, so I'll join her in her praises. On my skin, Lumière Blanche begins with very muted spices, then shifts to a delicate powdery-woody iris heart, and gradually dries down into a very soft almond with a scattering of cedar and sandalwood shavings. Its long dry down is a skin musk, without any of the soapy or "fresh" qualities of most contemporary musk notes. My description makes Lumière Blanche sound more feminine than it really is; I'd actually call it "androgynous," and I'd recommend it for nearly year-round use and almost any sort of occasion. It's very adaptable, yet it also feels strangely personal (hence my initial reluctance to tell everyone how good it is!). I'd suggest Lumière Blanche to anyone who loves Frederic Malle L'Eau d'Hiver for its sheer-and-misty combination of iris, hawthorn, heliotrope and musk, or L'Artisan Parfumeur Poivre Piquant, with its quietly quirky juxtaposition of pepper and cream. As for the official description above, I'll agree with the "comforting cocoon," although I'm not really getting the "sweltering heat from the sun" or the "blinding white hue." For me, Lumière Blanche instead evokes a pearly gray sky with a pale winter sun shining through a layer of clouds. As this exceptionally cold and snowy spell wears on and on in the Northeast, I'm finding that Lumière Blanche really does comfort me and provide me with a little extra inner "light." 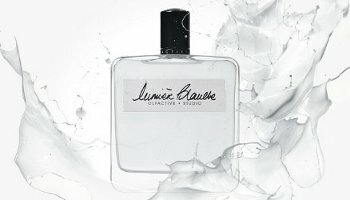 Olfactive Studio Lumière Blanche is offered as 100 ml ($195) or 50 ($145) Eau de Parfum. For purchasing information, see the listing for Olfactive Studio under Perfume Houses. I adore this fragrance as well. I actually bought it right then and there within the short 10 minutes of smelling it. I find it to be quite heat-tolerant, being absolutely bearable in warmer weathers, making it a great “transitional” perfume. Don’t you love when that happens? — a “coup de foudre.” I agree — it would work well in spring and early- to mid-summer. It’s like an all-weather fabric! Comforting cocoon… just love that. This fragrance sounds all very soothing and still and otherworldly. If you’re comparing it to FM’s L’Eau d’Hiver I’d say those words sum it up. Really wonderful photo by Vitali. I find this kind of fragrance much more comforting than a vanilla, which seems to be the ultimate comfort scent for many people (or so the marketers would have us believe?) — and yes, “still and otherworldly” are two more good adjectives for it! Sounds lovely, but I tend to avoid “soft,” “muted,” and “delicate.” Is it basically a skin scent or close-to-skin sillage, or can you boost the presence with a generous spritz? I love L’eau d’Hiver, which I find subtle without fading into the background, if that makes any sense! Hi! It’s not “delicate” overall, the same way something like L’Artisan Parfumeur Jour de Fete is — I think a generous spritzing would amp it up. It feels like a very sophisticated skin scent to me, thanks to the musk and the milkiness, but I do notice it from time to time when I”m wearing it. This is a lovely fragrance, but not as subtle on my skin as I thought it would be – it last quite a while. I get a striking resemblance with Penhaligon’s Vaara but can’t put my finger on what note it is. Something fruity and very persistant that took over Vaara after an hour or so. Does anyone else get this? I have to admit that I haven’t tried Vaara yet. Hope someone else will chime in! I have to admit I’m a bit disappointed with this perfume line. Really? That’s a shame! I’m getting pretty good staying power from this one, and some of the “darker” compositions, too. Oh interesting! Thanks for this review Jessica. I like but don’t love both Poivre Piquant and L’Eau d’Hiver, so maybe this will be the variant that’s just right! I’d definitely put it on the same “shelf” of an imaginary perfume cupboard, so who knows — you may love it! Hope you’ll have the chance to try it. Sounds like a must-try. That photo of the sunlit white sand beach is amazing. Anyone knows where that beach is located? According to Victoria’s review on BdJ it was taken in Sicily. That seems right. Apparently this photographer has done a series of beach photos — I wonder what the rest are like. Must go look! I only tried this once and remember liking it. Not a coup de foudre mind you. I’ve been meaning to get their sample set for a while. They no longer have the cheap one with the small samples which is what I wanted, but the newer one seems a good deal as well. I adore that photo. I know I sound like a broken record but it reminds me so much of the last part of the wonderful Taviani film Kaos. It is a film of several tales and the last one is called “Colloquio con la madre”. Part of the tale involves a visit to a pumice island, just as white as this island. Thank you!! That is really interesting! Thanks for this – this was my favorite of the line at first sniff too, but everyone else was raving about Flash Back and I felt odd. Undergreen’s White is another unexpected collection of white notes. I don’t think they overlap. I’ll have to compare and see if I have room for both. I should try Flash Back again; I think I liked it, but nowhere near as much as this one! I do have a sample of Undergreen White, and I was thinking of reviewing it soon… maybe I will! I’m sad to say that this one didn’t work for me at all And I’m a huge fan of L’Eau d’Hiver. I get the comparison but Lumiere Blanche has something in it that grabs hold of my nose hairs and imparts a nasty, bitter note that overshadows everything else. Probably one of those aromachemicals that really bugs some people (me).